About 30 years ago, the first mass-marketed running diaries appeared on the scene in tandem with the running boom of the 1970s. I still have mine—spiral bound, slick cover, photos, and inspirational quotes—and just enough space to record each day’s runs, times, weather conditions, and a few lines of free-form notes. I loved those yearly journals, because they were the closest thing to a diary I kept in high school and college, and because they were, for the most part, a record of sustained achievement. And I Ran: Pace allows you to view lots of summary information and data for four separate runs on one screen. You can still pick up a few different running journals at Amazon.com or your local bookstore. I tried to rejuvenate my paper-bound journaling habit a few years ago, but it didn’t stick for more than a few weeks. The reason, I think, is that there was a crucial disconnect: I was running with my iPod and relying on Nike+ to measure (and remember) each day’s run, and rewriting those details on paper seemed superfluous. I realize this isn’t very logical: after all, the Nike+ simply records time and distance and your pace at each mile or kilometer interval. It doesn’t record weather, take note of the course you ran, the shoes you wore, who you ran with, how you felt. It’s not well-suited to recording splits and other details about interval workouts. But there it is—I wasn’t being logical. Pace, a running journal app for the iPhone, may get me into the habit of keeping notes on my daily runs again. I currently sync my run information to the Nike+ Web site, which preserves the simple information—time and distance—and serves up some nice eye candy bar graphs. But Nike+ is very limiting—you can’t hand-enter or edit run information, unless you register for a separate (and distinct) account. You can’t export data. You can only slice and dice your data in a few very limiting ways (by run, day, week, and month). Ron Forrester’s Pace, on the other hand, requires you to enter some basic run information that Nike+ doesn’t accommodate. For each run, the Pace template requires you to enter your course, run length, time, and the shoes you wore (crucial if you’re careful about replacing worn shoes every 300 to 400 miles, as recommended). There’s also space to type in additional notes. You can enter course and shoe information only once, and subsequently select it from a list, a terrific convenience. You assign each course a name and default length, but you can change the distance manually. I liked this capability a great deal, as I frequently tack on an extra mile or two after covering one of four or five standard courses. I have no name for these add-ons, and their lengths vary, depending on many factors. Pace also enables you to set multiple distance goals, and track progress via simple bar graphs. You can tap a button at the top of the screen and quickly view how many miles you’ve put in for the day, week, month, and year. The transitions are consistently smooth and logical when you switch screens to enter different types of information. If you touch the wrong part of your iPhone screen by mistake and exit your journal, what you’ve entered is preserved, a feature that came in very handy when I tapped in a few weeks worth of data in one session. Pace does have some drawbacks and would benefit from a few additional features. One significant drawback is that while you can export data, you do so to an unsecure Web site. Your URL is determined by your iPhone’s UUID, and once you navigate to the Web address, you click on a link to download your data in CSV format. This works well enough, especially if you don’t care about your data’s security, but other apps enable you to e-mail this type of information to yourself, and it would be nice if Pace added the same capability. The developer promises to add statistical and graphing capabilities in future versions of the app; these will be welcome additions, as the iPhone is well suited to slicing and dicing data in a variety of ways. As is, Pace is a dependable app that’s been well thought out, and is enjoyable to use. 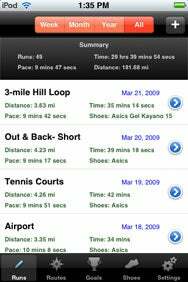 Pace is compatible with any iPhone or iPod touch running the iPhone 2.2 software update.